Abraham Ford (Michael Cudlitz) and Glenn Rhee (Steven Yeun) both found themselves on the receiving end of Lucille, Negan’s barb wire-wrapped bat on the Season 7 premiere of The Walking Dead.... However, a clip leaked right before Sunday’s finale that depicted a different victim. 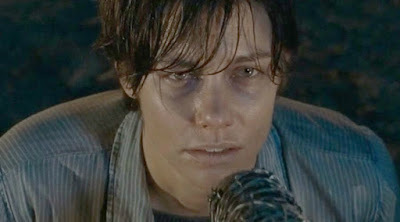 The blurry footage shows Maggie Greene (Lauren Cohan) as the unlucky winner of Negan’s brutal “eeny, meeny, miny, moe” game instead of Abraham. She takes two brutal blows to the head. Glenn cries out to his pregnant wife, but gets knocked out.